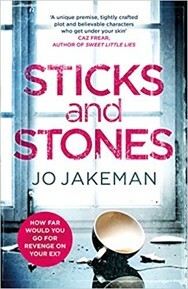 This debut novel is a thriller that takes domestic abuse to new heights – or perhaps that should be depths – in its graphic portrayal of how words [as well as the sticks and stones] can find their insidious way to destroy their target. Jo Jakeman’s novel is cleverly plotted, opening on the day of CID policeman Phillip Rochester’s funeral, which is attended by his wife Imogen and the two previous women in his life. Imogen watches the curtains close around him not with grief, but rather with relief at freedom, but with satisfaction, as do the two other women. It is over. He has met the death he deserved. The shadow of fear has lain over them too long. The novel then takes the reader back twenty-two days, to the day when Imogen decides to call at Philip’s new home, to which he moved after separating from Imogen. There are papers to sign, a divorce to finalise, if only for the sake of their young son Alistair who must surely come first. But he doesn’t. Phillip does, always and inevitably must come first. He isn’t in, when Imogen calls, and Naomi, his new partner, is hostile to Imogen at first. But then the truth begins to emerge and takes both of them on a roller-coaster ride in their efforts to escape the monster and save Alistair. The novel’s great strengths are its pace and its sheer readability which skim over occasional disbelief in the plot. For the plot to have begun with Phillip’s funeral might seem risky, but it pays off for the story of those twenty-two days more than justifies it.